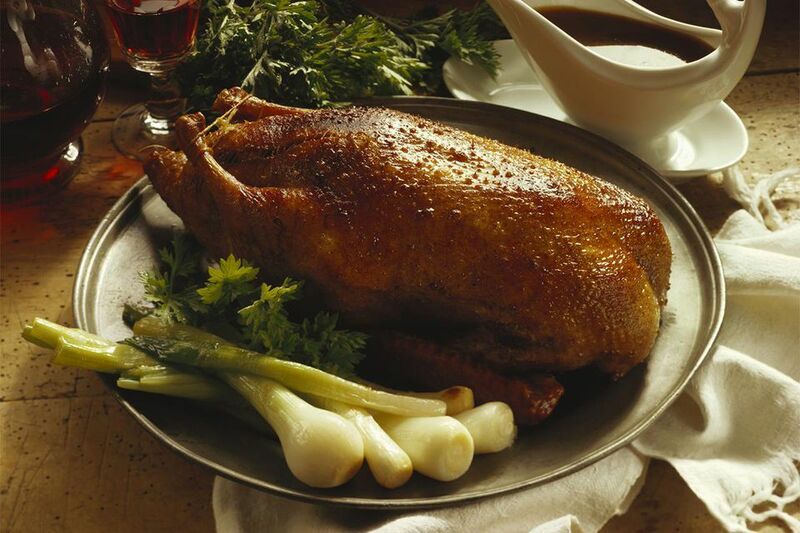 Duck is a fatty protein so prior to roasting it, you need to make a special effort to eliminate some of the fat. This is easy enough if you're pan-roasting breasts or cooking just the legs. It is far more tricky when roasting a whole duck. A two-step process to eliminate some of the fat starts by simmering the whole duck in a stockpot. By poking holes in the skin, it will allow the fat to escape as it melts. This extra step results in a wonderful broth you can use for cooking beans or making soup. Remove giblets from duck cavity, and cut off wing tips. Trim excess fat and skin from the body openings. Using a small paring knife, poke holes all over the duck's breast, legs, and back. Insert the knife at an angle to avoid penetrating the meat. There is about 1/4 inch of fat beneath the skin on the breasts and thighs and about 1/8 inch on the legs and back; insert as deeply as possible without making a cut more than about 1/2 inch long. Place the duck in a large stockpot. Add onion, carrots, celery, neck, wing tips, and giblets. Add enough water to completely cover duck. Remove duck from the pot. Add parsley, bay leaves, and peppercorns, and place pot over high heat. Bring to a boil skimming off any scum that forms. Carefully return duck to the pot, bring back to a boil, and then immediately reduce heat to a simmer. Place a plate with a heavy can on top of the duck to keep it submerged, and simmer for 45 minutes, removing any additional scum as it forms but allowing fat to accumulate. Remove duck, and pat dry, being careful to avoid tearing the skin. Cool to room temperature. At this point, you can move on to roasting, or you can refrigerate the duck on a dish, uncovered, which forces some additional fat out as the skin contracts and produces a crispier skin. Strain the stock, discarding solids, and refrigerate it overnight. The fat will rise to the top and you can skim that off. Freeze and save the fat for up to a year. The stock can be reduced (concentrated) and used for making gravy (with some of the duck fat) or reserved for other uses. If you refrigerated the bird, remove from refrigerator, and warm on the counter for 3 hours. Heat oven to 500 F. Place an oven rack one level up from the bottom and heat a roasting pan that can hold a roasting rack. Don't heat the rack. Mix together orange zest, salt, pepper, and rosemary. Sprinkle half the mixture inside the duck, and sprinkle remaining on the outside, patting to make it stick. Stuff the cavity with the orange, onion, and garlic, and roast for 30 minutes (rotate front to back after 15 minutes). Remove from oven, and let rest 15 minutes before carving. Instead of gravy, sauce your duck with cranberry coulis.